of the optical low-pass filter is cancelled out in the D800E. Two years on, Nikon is replacing both with a single model, the D810. This new camera is the first full-frame DSLR not to have an optical low-pass filter at all, while it also features a new 36.3-million-pixel sensor design. Inside the Nikon D810 is a 35mm full-frame (FX-format) CMOS sensor with 36.3 million pixels, the highest resolution currently available in a DSLR. With no optical low-pass filter covering the sensor, the D810 should resolve an exceptional level of detail. The native sensitivity range has been increased ISO 64-12,800, which can be expanded further to ISO 32-51,200. 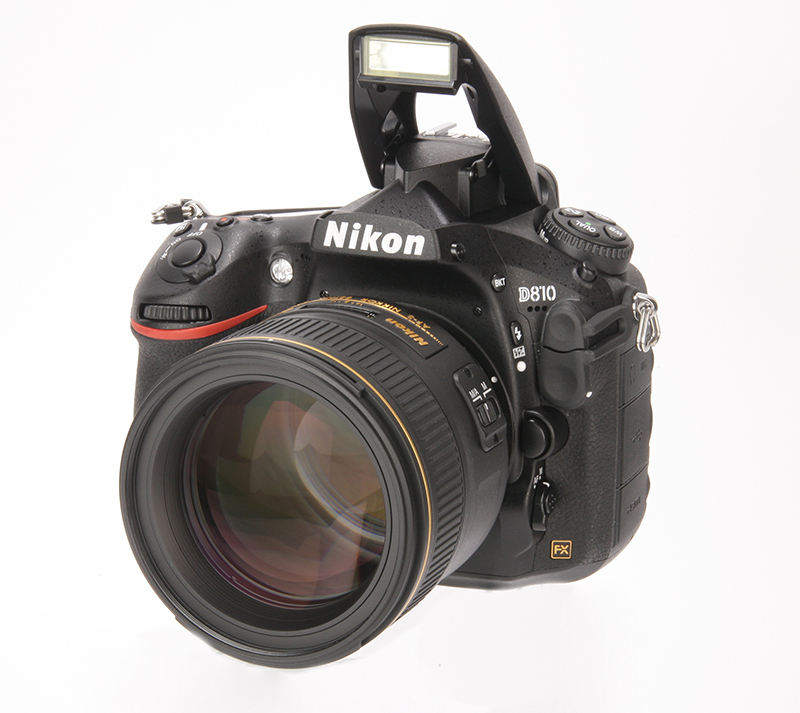 The D810 uses the Expeed 4 processor, which is also featured in Nikon’s flagship DSLR, the D4S. At full resolution, a shooting speed of 5fps is possible, which can be increased to 6fps by shooting in DX crop mode. This gives a 1.5x crop in the centre of the frame, resulting in 15.4 million pixel files. The downside comes when composing images, as the frameline indicating the active area can be difficult to see. A variety of other crop modes are also on offer, and with so many pixels to work with it makes perfect sense to use them. One issue many photographers have with the D800/D800E is the sheer size of the files; it’s all too easy to fill a 64GB card in a day’s heavy shooting. This then requires more time in post-processing, exhausts more resources when backing up, and takes longer to upload full-resolution files. Nikon has addressed this by adding a new S Raw format, a 9-million-pixel, uncompressed 12-bit raw file that gives a second option for photographers who don’t always need full resolution. This gives the D810 more diverse appeal. The S Raw files also offer sufficient resolution for 4K or HD video with the possibility of digital zooming, which is useful for animation and time-lapse work. Wi-Fi and GPS are unfortunately not built into the D810, although additional adapters can provide this functionality if desired. Another addition to the D810 is live view split-screen zoom, which allows users to magnify two separate parts of an image, positioned laterally across the frame. This can be useful for checking depth of field, or for levelling images. For this purpose, it can give higher visual accuracy than the onscreen pitch and roll level display. Interestingly, the Nikon D810 features a small pop-up flash with a guide number of 12m @ ISO 100. The big advantage of this is that it can be used as a commander to trigger Nikon flashguns off-camera. Video is available at 1920 x 1080-pixel Full HD, at frame rates of 60p, 50p, 30p, 25p and 24p. HD1280 x 720-pixel footage is available at 60p and 50p only. Normal and high image quality settings are available for each. A new video feature is zebra pattern, which overlays stripes on highlight areas that are in danger of blowing out and losing detail. This helps videographers to more easily gauge whether their exposure needs adjusting. In addition, the Picture Control menu adds a Flat option, which removes much of the in-camera image processing to give more flexibility in post-production.